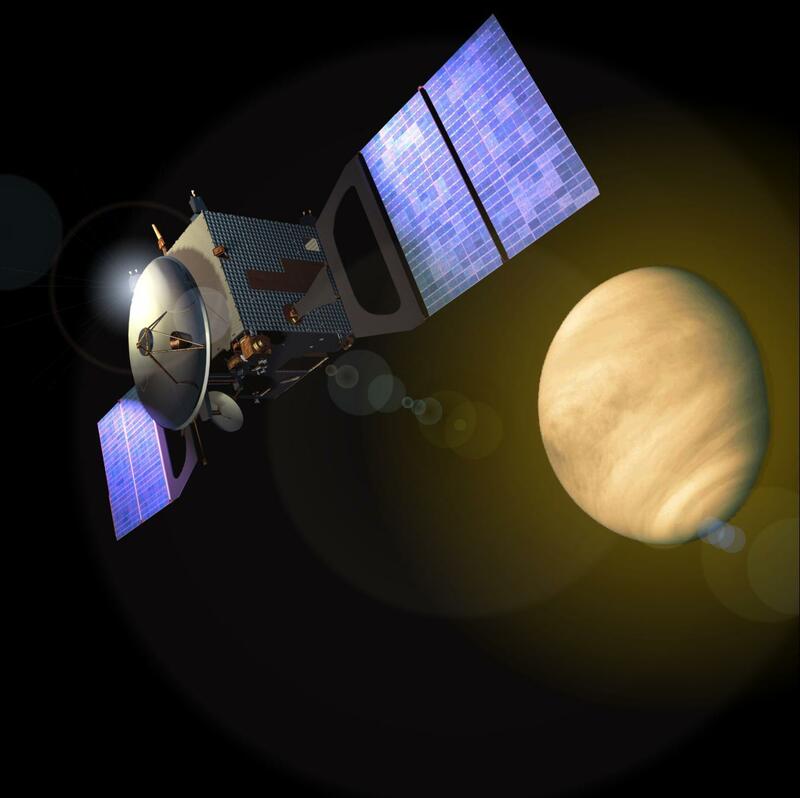 Venus Express is a re-use of the Mars Express orbiter design and will be the first European mission to Venus. Launched successfully 9 November 2005 on Soyuz-Fregat, arrival 11 April 2006. Venus Express will answer many questions about the atmosphere, plasma environment and surface of our sister planet. Our interest at MSSL-UCL is in how the solar wind, after it is deflected and slowed by the Venus bow shock, interacts with the Venus upper atmosphere and ionosphere. We will study how atmospheric escape occurs and how the energy input into the upper atmosphere works. Venus has no magnetic field - but it does have a thick, carbon dioxide-rich atmosphere. The surface pressure is 90 times the Earth's. As there is no planetary magnetic field, the solar wind can reach the outer regions of the Venus atmosphere. An ionosphere forms where the internal plasma pressure balances the solar wind pressure. Neutral atoms and molecules can be picked up, in a similar process to that at comets, by the solar wind and escape along the tail of the planet. MSSL are co-investigator in the Aspera team, providing electron calibration (electron sensor built by SwRI), blackening, a radiation shield and scientific collaboration.